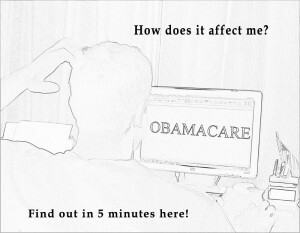 Obamacare – How does It Affect Me? The experts agree on one thing – the rules are very complicated and they affect people differently based on family size, how much money one makes and if health insurance is offered through work. The goal of this article is to make it understandable and show how it applies in your situation. First, what is Obamacare? It is a program that establishes a minimum acceptable insurance coverage so that when insurance companies offer plans, all people would be able to afford health insurance and the government helps those with lower income by paying some or all of the premiums on their behalf. Whoever decides not to get insurance pays a penalty, or “shared responsibility payment”. Tax Hikes Due in 2012. Does an 80K Family Income Mean You Are Wealthy? The Fiscal Cliff.